I have a passion for Bananas. You might say I’m a connoisseur. We usually have one or two large bunches in the house at all times. I love them on their own, sliced over warm oatmeal, mixed in with cool cereal, over ice cream (even banana ice cream), in cookies, as a substitute for butter in many baking recipes, and even in brownies. You might say Banana’s are one of my favourite fruits. I think they’re tied with apples. I feel like apples and bananas are just a given staple in our house, we’re never without either of them. Ok, well maybe not true for this week. Adam sold his truck last week, so he’s been taking my car to work (since I’m only at school a few days a week). This means during the day I have no car. Although, we live right across from an outdoor shopping centre/mall that I can easily walk to if we actually needed anything. It’s funny, I thought I’d be over there everyday when we first moved in, and much to Adam’s surprise, and probably relief, I don’t go over that often. Maybe once every two-three weeks I’ll walk over and shop (it’s not as hard as I though it’d be to live across from an H&M haha.) This is probably because I’m so busy anyways to even have time to stroll over and peruse. I have been trying, and I mean trying not to go overboard with buying groceries. I was feeling like we were throwing away a lot of produce at the end of the week because it wasn’t getting eaten. And I wasn’t happy about it (although we do compost all organics.) I tried to blame Adam, because really he won’t make himself food unless I’ve already prepared it. He only eats breakfast at home, lunch at work, and then I make dinner. However, if there is produce etc in the fridge and he’s hungry, he’d rather not go to the hassle of making an entire meal, and opt for something like an apple or bowl of cereal if I’m not making something. He’s not a fan of cooking. So, a lot of the food doesn’t get eaten. And I’m home most of the day now that school is out, and my classes are later in the day. I only really eat a small breakfast and a smoothie, so I’m not making a huge meal other than dinner. But when it comes to dinner it is always heavy on the veggies. But still, I was finding I was throwing out some bad lettuce or even kale, tomatoes, cucumber etc. that I had bought too much of in anticipation of eating it during the week. I think it’s also our schedules. Lately, I’ve had baseball Monday night, Tuesday and Wednesday I have classes until late, and then Thursday I might have baseball again. So, we’re not home for dinner a few nights each week. Which means, lots of veggies get left. Weekend are usually ok, because we’ll make dinner Friday, Saturday and Sunday at home. In the end, I’ve realized I have to buy less groceries. Even though Adam can eat a lot. Usually we’ll just go up to the produce market or the butcher shop that night if we want to make a specific meal. Now, I do love meal planning, and I always have some idea of what I want to make that week, but I won’t buy all the items just in case we actually don’t get around to having time for dinner that week. I have to say, it’s actually nice not to have to go on a big grocery run, or think I had ‘better go buy that.’ It’s against my usual habits, but I think I’ll get used to buying less. And hey – even better, less money, and no money/food wasted, which was my biggest concern, wasting food. Do you do a big grocery shop at the beginning of each week? Or do you buy-as-you-go for meals, and pick up that day? One thing I never worry about really is fruit. If it’s starting to brown, it goes in the freezer. And when it comes to Bananas, you can never waste them. If they’re really brown/starting to brown, they either get sliced up for banana ice cream, whole for banana bread, or for smoothies and put in the freezer. 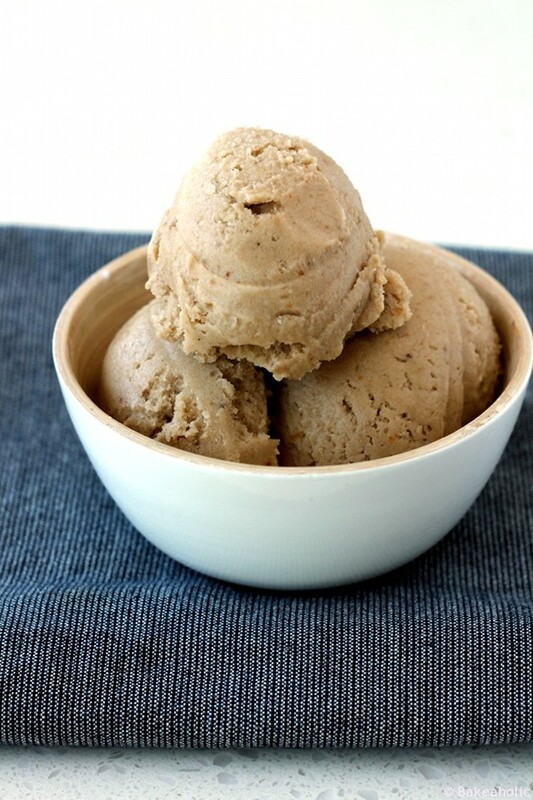 And even better – 2-Ingredient Peanut Butter Banana Ice cream. My new favourite combination. It’s super easy, and can be prepped well in advance, and kept in the freezer for up to a month. For summer I think I’ll have a batch in the freezer each week for a quick healthy, yet satisfying, sweet frozen treat to beat the heat. Slice your bananas, and place into a plastic freezer bag. Make sure they are in a single layer, and lay flat in the freezer. Allow to freeze overnight, or up to a week. 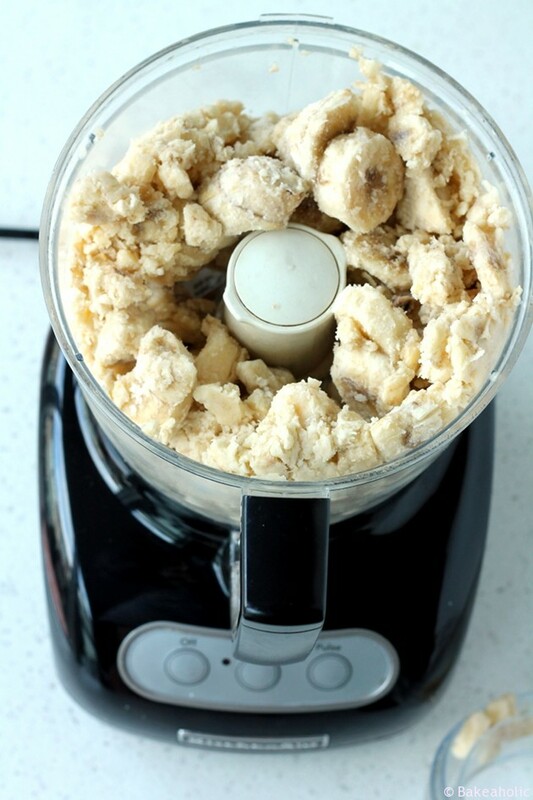 Remove frozen banana slices from freezer and place in food processor. 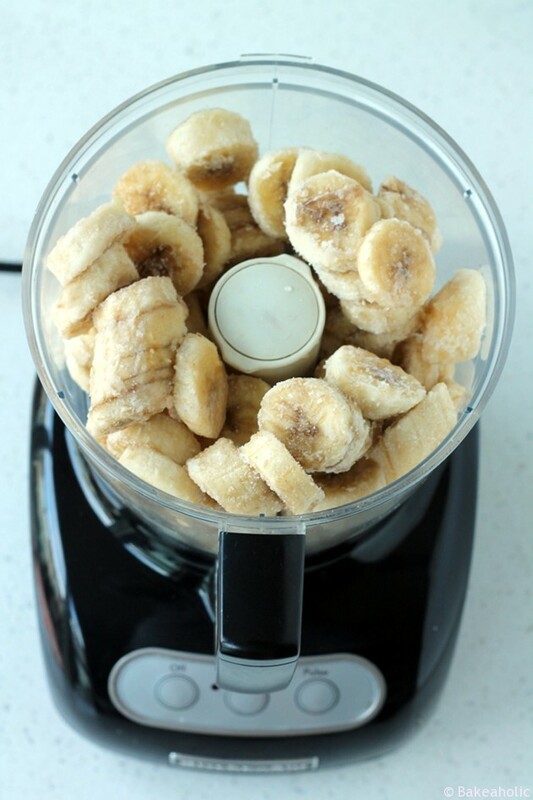 Turn food processor on and blend bananas, stopping to scrape down when needed. This will take about 5 minutes. Pulse if you need to, and stop to scrape down the sides so the chunks all get mixed int. Allow to blend until smooth. 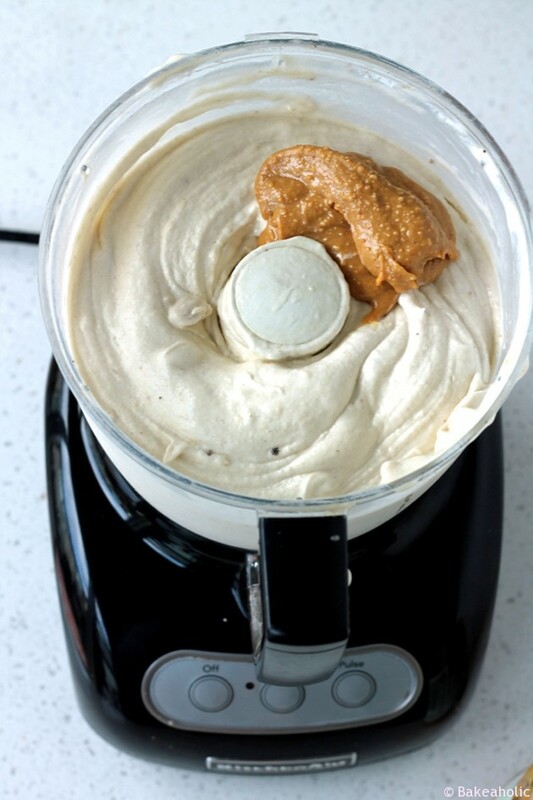 When it is all blended, add in the Peanut Butter. Pulse again until completely mixed. You can eat it like this, soft serve, or, transfer ice cream to a plastic tupperware container and return to freezer. Freeze at least 3-4 hours, or longer before serving. Keep leftovers in the freezer. WHAAAAAT?!?!?!? You can make this ridiculously creamy, gorgeous ice cream with only frozen bananas and peanut butter?! My mind is blown. Thank you thank you thank you for this recipe! Great minds think alike – I just posted an easy peasy ice cream recipe on my blog too – you can also make ice cream with only condensed milk and whipping cream. I see a lot of ice cream in my future now that I know both techniques! As for groceries…sigh…I only shop for myself and my Husband but I’m also guilty of over-buying. I had grand plans last week to eat lots of salad and I still have lettuce and kale sitting in my fridge, sadly wilting. I HATE wasting food, especially knowing the environmental damage that’s done when it just goes into a landfill. I live in a condo so I don’t have a compost. You’re totally right about just buying in smaller quantities when you need it.